Imagine, if you will, standing on a three-legged stool. You're reaching into a high cabinet to get something out when all of a sudden one of the legs breaks and...ooops...oh well, the stool is only sturdy when all three legs are attached. Let's see how we can assure that the legs of our personal worlds are sturdy. Deeds of kindness - yes, that includes helping a little old lady cross the street or giving some coins to the beggar asking if you can spare a dollar for a cup of coffee (used to be a dime!). It can even be carrying a neighbor's groceries in from the car or offering to pick up something at the store for an elderly or ill friend. One sturdy leg coming up. The service of G-d, praying - hmm. Raising your hands, lifting your eyes to the heavens and murmering, "G-d help me!" at those moments of desperation is definitely counted. But to make that leg a tad sturdier, try incorporating formal prayer into your daily schedule. It can be as simple as the "Shema" before going to bed at night or the "Modeh Ani" upon awakening in the morning. They're short and to the point. Now, for that third pillar, Torah study. Of course it can be a challenge to find the right level class on the right night in the right place with the right teacher. But nowadays, thanks to the explosion of technology, you can study Torah anywhere, anytime, any subject that suits your fancy. Torah study is nothing to be afraid of. You don't need any special background or credentials to participate. And it carries special meaning for every Jew. Only through studying the Torah and all its beauty do we come to understand not just how much it applies to each one of us; but also how much more sturdy and stable our world is with it. You can call your local Chabad-Lubavitch Center to find out what classes are available. They can also give you information about Torah tapes and Torah on the telephone. You might want to try the new jnet.org that will pair you up with your own "chevrusa" study partner. If none of the above suggestions meet your fancy, start an informal study group of your own with a small group of friends. Organize a "lunch and learn" class at your office. Or just buy an informative and/or inspirational Jewish book at your local Judaica store and start reading. Whatever it takes, make sure that third pillar is strong. And, whatever you do, remember that if you are trying to reach up high, first make sure that all three legs of the stool are sturdy! The Evil Inclination sometimes disguises itself in a "robe of holiness." It discourages a person from performing a mitzva (commandment) through guile and doubt, presenting all sorts of seemingly plausible and erudite excuses. A person may become confused when the two paths of action before him both seem to have merit. The Evil Inclination can even make a sin appear to be an actual mitzva. A Jew's connection to G-d is so strong that it cannot be split asunder by any power on earth. When a Jew does a mitzva - mitzva comes from the Hebrew word for binding together and connecting - he ties himself to G-d with a supernatural strength. Armed with this power, we can see through the mask of the Evil Inclination when we are presented with even the finest points of contention. South African emigration was at its peak and the Cohen family decided to leave as well, to make a fresh start in Israel. Mr. and Mrs. Cohen, and their only child, Batya, rented a townhouse in a heavily South African community in Israel, with its own community shul (synagogue). Batya had just graduated high school so the timing for their move provided the opportunity for an exciting new beginning for her as well. Their joy was short lived when it was discovered that the headaches Batya was complaining about were due to a serious inoperable brain tumor. Within a short time she was gone, an only child, just 18 years old. Shortly thereafter, Mrs. Cohen was diagnosed with leukemia. Still devastated from Batya's death, the situation seemed hopeless. Rabbi Levy, the rabbi serving the South African community in Israel, knew of my friend Esther and her work with energy healing, and he asked her if she would be willing to see Mrs. Cohen. Of course, she agreed. Mrs. Cohen had been told that her only hope was a bone marrow transplant, but so far no match had been found. The best chance is a close blood relative, but Mrs. Cohen had none alive. After working with her, Esther took her leave. She called Rabbi Levy and said that she felt that somehow, somewhere, there was a door remaining to be opened, but she didn't know what. As soon as she hung up from Rabbi Levy, her cell phone rang. It was a friend who was in labor wanting to know if Esther could come be with her. Luckily, the birthing center was right near the hospital where Esther had just visited Mrs. Cohen. Esther had attended many births in this center, and so she was very friendly with the people who worked there. As she walked toward the nurses' station, she suddenly stopped. She saw a young pregnant woman, who said her name was Sara, checking in. Esther was taken aback by Sara's strong resemblance to Mrs. Cohen. It crossed Esther's mind that perhaps this young woman might be a suitable bone marrow match and that maybe it was worth exploring after she finished helping her friend give birth. The birth went smoothly, thank G-d. Afterwards, Esther asked about Sara. She was told that the couple had recently moved to Israel from South Africa. Esther asked the nurse to find out if they would mind if she approached Sara after the birth, about being a possible bone marrow donor for someone. The nurse came back saying they would not mind at all. A few hours later, Sara gave birth to a baby girl. Soon after, Esther introduced herself to Sara and her husband and explained the bone marrow donation procedure. The young woman agreed to have the blood test, although she had just given birth! The blood test was administered. Now late at night, on Esther's way home at last after a long day, her cell phone rang again. This time it was the blood technician who was excited to report a perfect match! "A match like this is usually only an immediate blood relative," he said in wonderment. Elated, Esther immediately called Mr. Cohen with the great news. That very night, procedures were begun for the transplant to take place. A little while later, Sara called Esther to invite her to her daughter's baby naming. It would take place on Thursday morning in the South African community shul. During the conversation, Esther discovered that Sara had recently lost both her parents in a road accident in South Afirca, and this was one of the main reasons they had left. She was an only child and the memories in South Africa were too much for her. So they had moved to Israel. New country, new life, and now a new baby. Later that day, Esther met Mr. Cohen and told him about the baby naming. Thursday morning both Esther and Mr. Cohen went to the baby naming. They were both taken aback when the baby's name was announced. Batya! As Mr. Cohen turned pale from the shock of hearing the baby's name, Sara stood up to explain to the assembled guests why they had named her that. "I was adopted," said Sara. "I have always known it. I have always felt gratitude to my birth mother for giving me up for adoption instead of ending the pregnancy. My adoptive mother, who could not conceive a child, often told me that I was a gift from G-d. Now that I have my own child, I realize that all children are gifts from G-d. So we named our daughter Batya, "daughter of G-d." May G-d help us raise her to serve Him with all her heart." The transplant was a complete success. Now the question begged to be answered. Who was this perfect match? Mrs. Cohen knew the answer. When she was a young girl of 16, before she was Torah observant, she had become pregnant. Over her parents' objections, she had wanted to have the baby and give it up for adoption to a Jewish couple. At that time, an emissary of the Lubavitcher Rebbe had arrived in town. He was looking for students to come to his new seminary for girls with little Torah background. When he heard about the situation, he suggested that she study at the seminary while carrying her baby to term there. He also knew of a couple who desperately wanted to adopt a child. Sara was this child, none other than Mrs. Cohen's own first child whom she had never seen before. Now this daughter had returned the gift of life to her own mother. The family was now reunited and became very close. Sara recalls how she had worried that her baby would grow up without the love of grandparents. Mrs. Cohen recalls how she was sure that she would never experience the joy of holding a grandchild. I call this story "Connecting the Dots" because it is a perfect example of how, though mostly we are unable to see the whole picture, sometimes G-d shows us that He is behind every detail. Nothing proves G-d's love for each of us like Divine Providence. Reprinted with permission from the N'Shei Chabad Newsletter. Rabbi Sholom Ber and Rivka Galperin are moving to Miami, Florida, as shluchim (emissaries) of the Lubavitcher Rebbe where they will serve as Program & Youth Directors at Chabad of Kendall / Pinecrest. Modern medical wisdom recognizes that good health depends on a patient's emotional state and mental attitude. For centuries, it has been customary for Jewish women to adorn both the birthing room and the cradle with Psalm 121 (Shir Lama'alot). The Psalm states our declaration of dependence upon the Creator for our safety and well-being, and His commitment to guard us at all times. To get a free color print of the Psalm call (718) 756-5700, and mention Lchaim weekly, or visit www.LchaimWeekly.org/general/art/shir-lamaalot.jpg. ...I am not pleased. It appears from your letter that the trust in G-d that should be expected of a Jewish woman in general and of a Chasidic wife in particular is not present in yourself in appropriate measure. Accordingly, this affects your health and your household. Every Jew, man or woman, should constantly keep in mind that G-d, Who conducts the world at large, no doubt also conducts the microcosm of each of us. And just as He has a say in the big world, He certainly has a say likewise in our little personal world. One should depend on Him, trusting that He no doubt leads things in a good direction. Moreover, one should not interfere with this by one's uncertain trust in Him, or by factors that do not accord with the Torah - and one of these is [a lack of] marital harmony. Until after the arrival of Moshiach, there is no person without a fault. Hence, just as one person has a fault, it is certain that so, too, the other has a fault. And just as one does not want to uncover and highlight one's own fault, one should also not highlight and magnify another's fault. This is how things should be between Jews in general; how much more so when the person under discussion is your husband and the father of your child. My aim here is not to rebuke, but to make you aware that your situation is not as harsh as you perceive it to be, nor is it exceptional, as you imagine it to be. Each of you should overlook things, preferring to find ways of establishing domestic harmony. And once domestic harmony reigns, this is the vessel into which G-d pours blessing, and success, and good health, and a livelihood, and blissful contentment from one's children. In my opinion, you would do well to ask your doctor for directives regarding your food and beverages and home management, and to act accordingly. And G-d will no doubt help you, so that everything will come about at the proper time, in a positive way, and successfully. Your letters of 9/4 and 2/5 reached me after having been delayed on their way here, and I was very happy to read that your wife's pregnancy went well and that she gave birth to a son who is named [...]. Another thing to keep in mind is that one has to fashion vessels that will contain G-d's blessings. In general terms, this means studying Torah and observing the mitzvos (command-ments); in particular, it means contributing tzedakah (charity). If a person thinks that his livelihood is meager, he should donate more than previously. In that way he shows G-d that his charitable needs are greater [than heretofore], and as a matter of course He will then provide a greater income than heretofore. 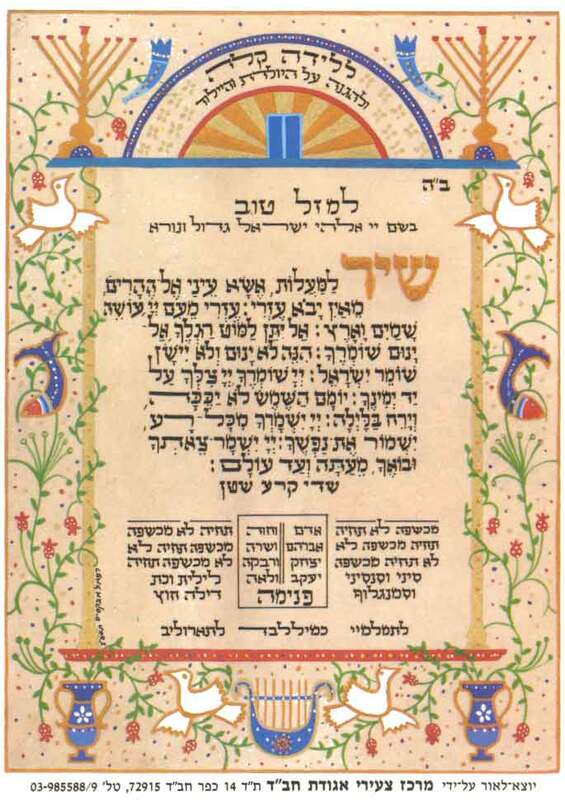 Translated by Rabbi Uri Kaploun, reprinted from In Good Hands, Sichos In English. Why are Ethics of the Fathers read on each Shabbat from Passover until Shavuot? We read one chapter each Shabbat following the afternoon prayer because these are the days leading up to the giving of the Torah and these chapters from the Mishnah contain ethics and moral exhortations to help us improve ourselves so that we are worthy of the Torah. Many have the custom to continue reading these chapters throughout the summer months until Rosh Hashana as summer is a time when people are prone to become more lax in their Jewish observance. Connecting Passover and the Holiday of Shavuot is the period known as sefira. We count the days of the Omer starting on the second day of Passover - our day of liberation from slavery. We continue counting for 49 days until the day on which we commemorate the receiving of the Torah - the culmination of our liberation. What, we might ask, is the point of counting days, measuring time? Time just marches on. We can all march to the beat of a different drummer, but we can't actually change time, can we? Quantitatively, time cannot be changed. But, we learn from sefira, that qualitatively, time can be changed. Time is like a container. We can fill it with nothingness by wasting it away, or, we can fill it with meaningful activities. In the days between Passover and Shavuot, we should be preparing for the receiving of the Torah. During this preparation period, we must make sure to fill our time "container" with meaningful accomplishments in matters of Torah study and mitzvah performance. In this way, we will actually be able to "stretch" time. By instilling our actions in the here and now with Jewish content, we fill our limited time with infinite and eternal acts. We transfer and elevate our own time beyond and above time. And these shall be an abomination among the fowls...the stork- chasida. (11:13-19). Whatever goes on its belly [gichon] ...you shall not eat; for they are an abomination (11:42). According to the Kabbalist, Rabbi Yitzchak Luria, the commandment to love one's fellow Jew must be accepted before beginning to pray. Only when "the congregation drew near" to each other in love and unity, did the Jewish people "stand before G-d" in prayer and supplication. On Portugal Street in the city of Posen in the year 1682 stood a grand house, that belonged to the goldsmith Avigdor Tuvye, and his wife, Gittel. Seven other families, all upstanding, respectable Jews, also inhabited it. The owner of the house, unfortunately, led a less than impeccable life, indulging in both drink and gambling. Whether or not these loose habits caused his untimely death is hard to say, but both Avigdor and Gittel passed away. And as they left no children, their apartment became vacant. Not long after the owners' demise, the residents of the house began to be bothered by all sorts of wild screams and laughter emanating from Avigdor and Gittel's former apartment. Soon, all were aware that the place was being haunted by hordes of demons and ghosts. Baruch Batlan (father of Rabbi Shneur Zalman, the first Chabad Rebbe) was the first tenant in the building to move out. On his next visit to his teacher Rabbi Yoel, the "Baal Shem" of Zamostch, he related the strange circumstances which had prompted him to move. Rabbi Yoel inquired about the character of the former owners, and was told that they were both coarse, but generous people. Gittel, the wife, was involved in many charitable causes, but she was also rather vulgar and given to uttering frequent and virulent curses against those she disliked. Rabbi Yoel, having heard this tale, issued his "prescription" to cure the house. The legal heir to the house must be convinced to make it a synagogue, and only thereafter could they undertake the exorcism. The situation in Posen had gone from bad to worse, with horrible screams drawing a crowd of onlookers night after night. The town's mayor, a devout Catholic, beseeched his bishop to come and try to drive the creatures away. Armed with holy pictures and crosses, the priests assembled opposite the house to recite their prayers. But, as if in response, the windows of the house flew open, revealing the most horrifying, frenzied aberrations. The priest fled in terror. Soon after, Baruch and nine others set about to follow Rabbi Yoel's instructions. Carrying Torah scrolls wrapped in prayer shawls, they ordered the spirits to depart. When there were no results, the minyan burst into the apartment. They were met by the sound of breaking glass and the appearance of the weirdest collection of creatures imaginable. They shrieked and flapped their black wings, screaming, in their frantic attempts to escape, leaving a disgusting stench in their wake. The town reeled with news of this miracle. For six weeks the house was quiet, but then a terrible noise came from the cellar. The neighbors, so recently relieved, were again terror-struck by the demons' reappearance. One day, one of the tenants, a furrier, sent his son to the cellar to fetch some pelts, which were stored there. When he opened the trap door, the boy was greeted by the emergence of a monster so frightening, that the poor fellow became deranged from the shock. Then, it was decided to call Rabbi Yoel and get rid of the menacing spirits once and for all. Rabbi Yoel summoned a rabbinical court and prepared a case against the creatures. Charging them with overstepping the boundaries set for them, he ordered them to depart at once from the world of humans. They, however, countered his charges, protesting that they were merely obeying their own leader, Ashmadai, the demon prince. They were, so they maintained, the legal heirs of Avigdor and Gittel who had created them through their evil thoughts and curses. So, the argument continued between the demons and the Rabbi over the disposition of the property. Finally, in the midst of great pandemonium, Rabbi Yoel roared: "You demons! I command you in the Holy Name to disperse by order of this holy court!" No sooner had he spoken than a muffled crying was heard. Immediately stillness pervaded the room. From that time forth, the demons were never again seen or heard on Portugal Street. Rabbi Yoel was besieged by requests for blessings, and the son of Shlomo Moshe the furrier was cured. Adapted from Memoirs of the Lubavitcher Rebbe. Our generation is like a mountain climber. As he nears the summit, he has to exert himself to the utmost to reach it, and in so doing he is glad of every branch or rock that he can use as a foothold or to grasp or lean on. Also, he must have light so that he can see what he can grasp, and when it comes, he treasures it. We are nearing the summit of the mountain. There is only a short way to go until Moshiach. At this time, then, we should value every positive thing, and we are in need of light - the study and dissemination of Torah.